As I told you, I made trousers. Trousers cut a bit shorter. I'm sure there's a proper name for a pair of trousers in length. In fact, I bet there are several names with claims at being the proper one, so I'm not going to bother with them. 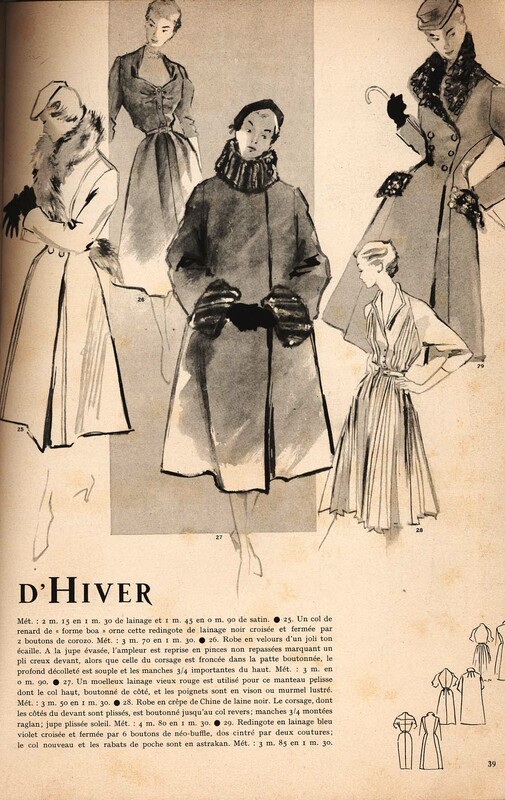 If you consider my earlier experiments with different styles and shapes of trousers, these are pretty tame. Just a shorter version of a tried and tested pattern, so not a lot of risk at creating something very unflattering. 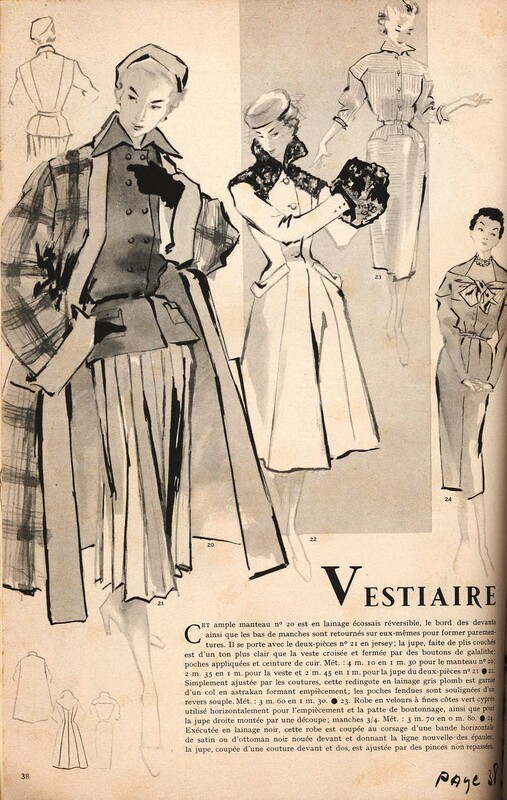 However, a lot my other trouser-experiments (certainly of those which made it into regular circulation) sort-of tied in with existing fashion trends. This one doesn't. I really like how the trousers look with my lace-up boots. I bought these last year after a long and unsuccesful search for simple black knee-high boots with round-ish toes and heels about as high as the ones on these and, most importantly, a good fit around my calves (almost all I found were too wide, the two pairs that weren't were quite wrong is some other way). I like lace-up boots in general but these are pretty in-your-face and I've found it hard to make them work with my wardrobe. This look is definately the way forward! As I told you in the previous post, I made these trousers from a coupon of velvet/corduroy (there are wales but they're very shallow, so it's something in between). 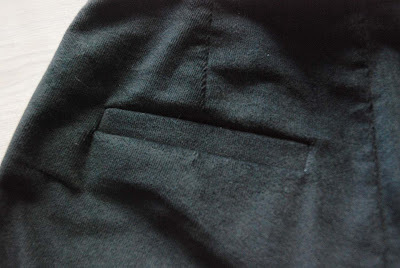 Straight waistband at the natural waist, scoop pockets at the front and single welts at the back. Here's what those look like. And it's hard to photograph, but I thought I'd mention it anyway (I bet most of you know this little trick already, but I also come across a lot of seamstresses who don't know and it's usually not in sewing instructions): If, like me, you're not a fan of topstitching (topstitching is great for jeans, works well with casual clothing and is a natural result of making flat-felled seams but, if you ask me, that's about it) and you're making some form of scoop or slant pocket, you can also understitch the pocket lining at the edge of the pocket opening. Just press seam allowances towards the lining (after clipping, if necessary) and stitch through the three layers. 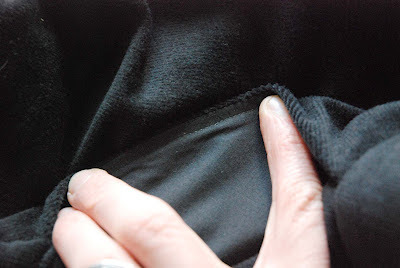 Works just about as well as topstitching to keep the lining from peeping out but without those pesky extra seam lines. After taking it, I did continue to cut the pieces but actual construction will have to wait until tomorrow evening. Although my head is full of great and glamorous coats, suits, dresses and silk tops, it's none of those. As much as I love pattern making, it's a process, it requires more time and brain-power than just cutting from an existing pattern and sewing. So, to edge gently back into sewing after some time of low mojo, I decided to make another pair of my wide-legged trousers. I shaped the scoop pockets at the front just a bit different and there will be single welts at the back, no pocket flaps. The biggest change, however, is also the oddest one: the length. As cut, this pair will be three-quarter length. I got this idea that such a thing might look great with my new-ish (bought last winter and not yet worn a lot) boots. And this way, these trousers fit this particular piece of fabric. The fabric is a coupon of cotton not-quite-velvet yet not-quite-corduroy which has been in my stash for about two years. I always liked its weight and look for trousers, but at 1,05 m, it was a bit short for that purpose. Of course, I could also have gone with a lower rise, a slimmer cut and maybe no pockets but that just wouldn't be me, right? 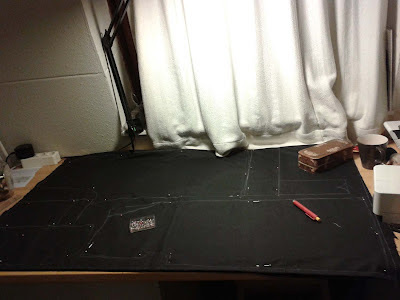 Have you started sewing for autumn (or spring, if you're in the southern hemisphere) yet? I have to confess I'm a bit slow to start this year. Mojo issues, don't ask. from Modes et Travaux for October 1951. This was a French sewing and craft magazine which was sold in the Netherlands with translated texts. 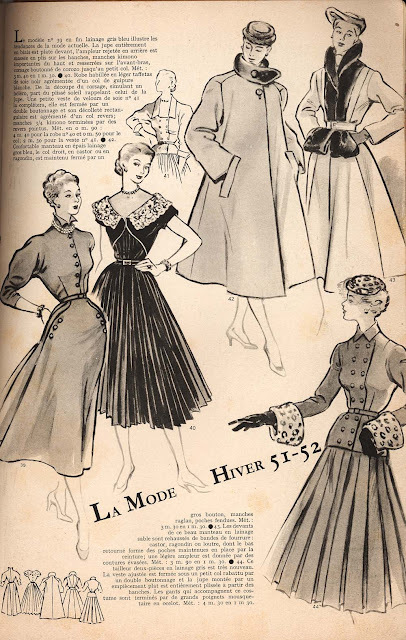 Unfortunately, all the sewing patterns were only available by mail order, so it didn't come with any patterns. This is the other side of the same spread. How about that raglan sleeved plissee dress? 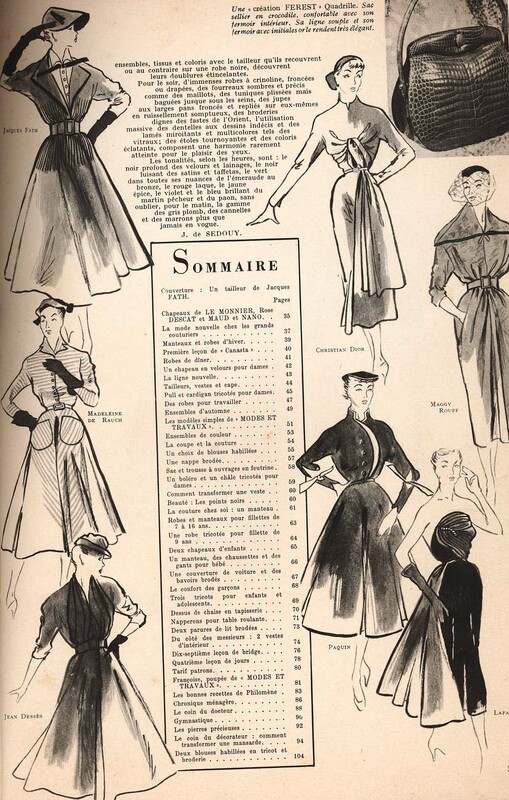 Then, there are festive dresses. I just adore that sleek long one on the right. It's funny. 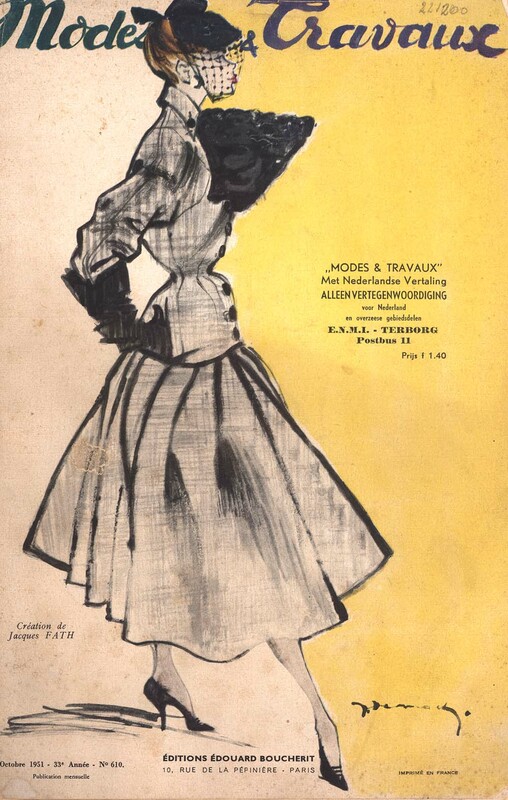 I think I've got some Dutch magazines (mostly Marion) from the same year and the designs in those are all proper, buttoned-up domesticity. These French ones on the other hand, display an obvious joy-de-vivre... and cleavage. Of course, there are also hats for the new season. 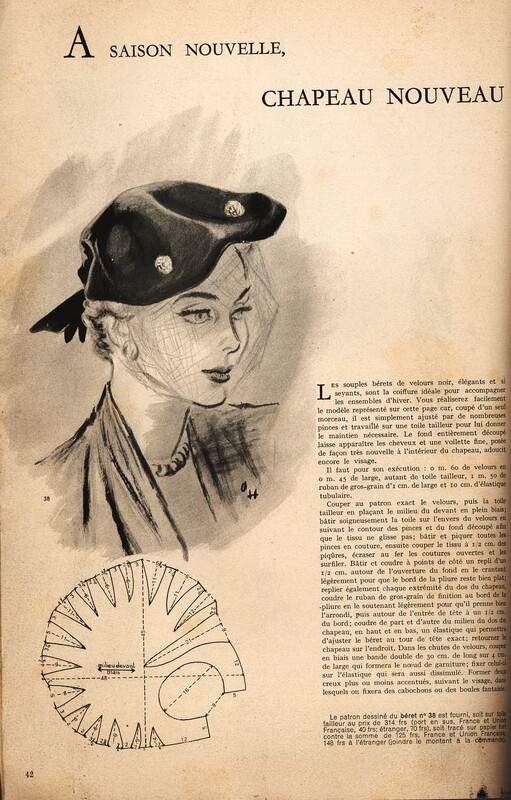 This glamorous beret even comes with a scaled-down pattern. I'll skip a little bit, just to avoid repeating myself and/or making this post super picture-heavy. And we're on to the coloured pages. 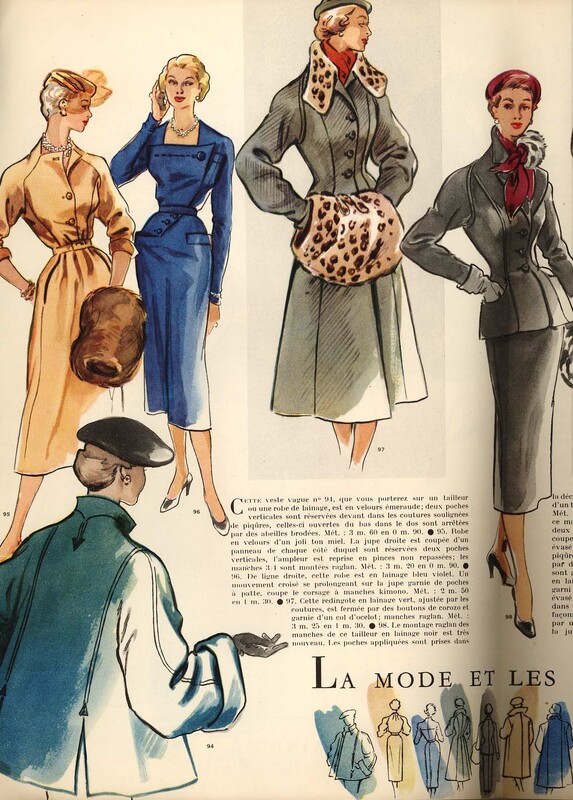 You just don't see coordinated three piece sets anymore, do you? This luxuary magazine even has more than one coloured page inside. 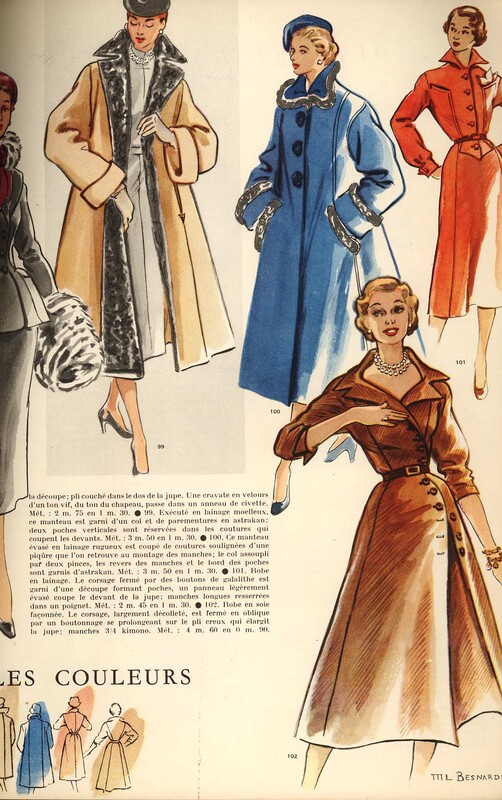 On this spread I love the chic suit in the center as well as that a-symmetrical dress on the far right. 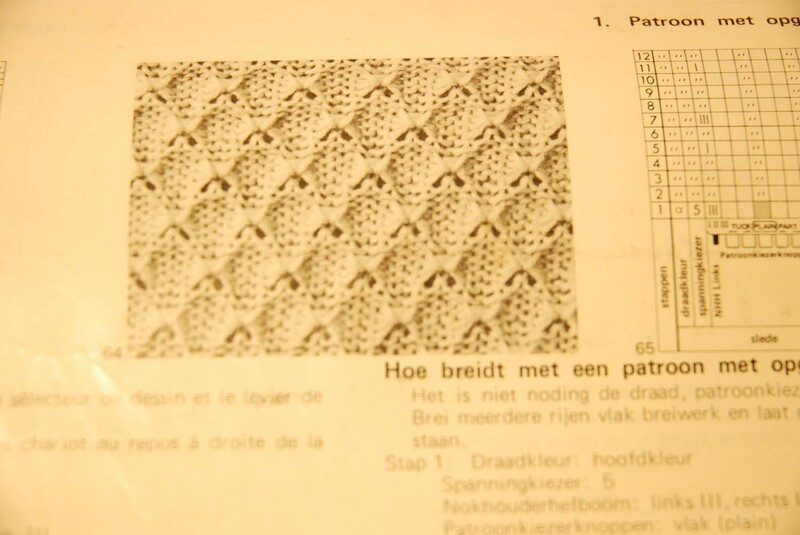 After that, it's two pages of children's patterns, different embroidery projects, some recipes and some knitting. I'll just show you the most flamboyant example of the latter. These sleeveless knitted tops. Were these for evening wear? 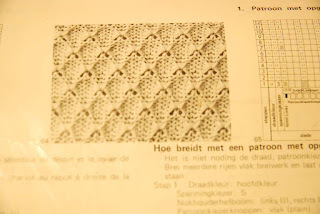 The Dutch translation just speaks of using de-luxe yarns for them, with some sparkle for those gold lines. 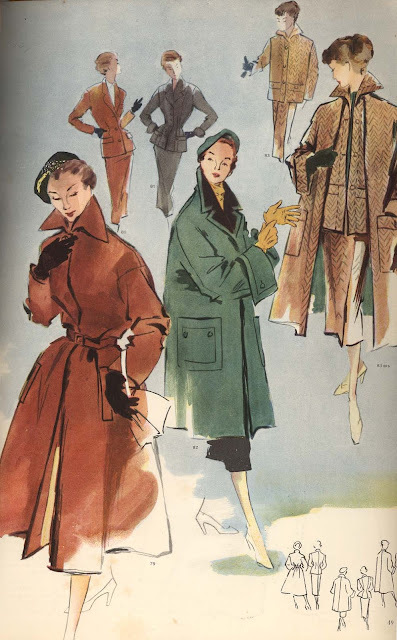 What do you think, is there any inspiration there for an autumn/winter 2012 wardrobe? But today, the fabric market was in town. 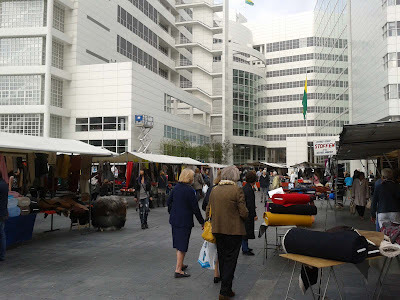 This particular fabric market, "Stoffenbeurs", is held twice a year (in autumn and in spring) in various cities across the Netherlands (it has a competitor called "Stoffenspektakel" which is basically the same, it is just held in different places and sometimes at indoor venues). All combined, the vendors sell lots of fabric, of different kinds and in different quality and price categories. But there are also several stalls selling notions, one with lingerie and swimwear fabric and notions and one with leather. 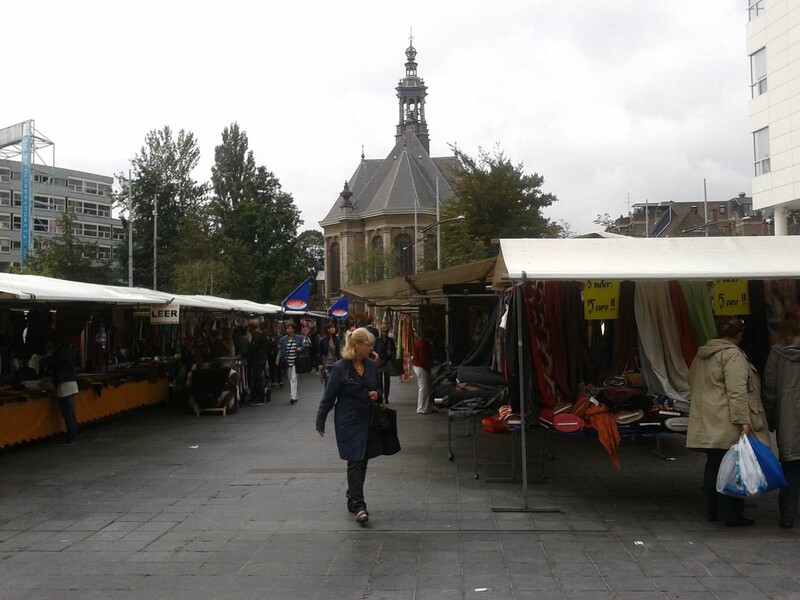 Today (Stoffenbeurs actually goes to The Hague, Rotterdam and Amsterdam twice each season, but the latter one in a different location), it was held at a mere 10 minute walk from my home, so, of course, I couldn't resist having a look. Unfortunately, the colours in the picture don't look anything like the real thing. 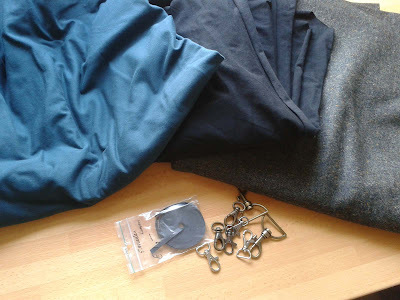 I also bought more of my favorite swimwear elastic and some metal bits for bags I want to make. I did resist buying buckles. Somehow I always think I should buy nice-ish buckles. In reality, I have quite a few of them in stash, I usually don't put buckles on the bags I make and I rarely make belts. Did I mention it was working? I've knitted something I can actually wear! First, I just sewed the outer few stitches of the top together to form the shoulders. This seemed like a good idea but just serverd to create a neckline so tight that I could only get my head through at the risk of skinning my forehead. (the skipped stitches in the pattern make it hard to finish the final row of stitching loosely enough) So, I took those stitches out (I may have snipped an important piece of thread while doing so, one belonging to the upper edge itself) and, with needle and yarn, made improvised shoulder straps. Although it certainly isn't flawless, it definitely seems wearable to me, so I'm calling it a win. 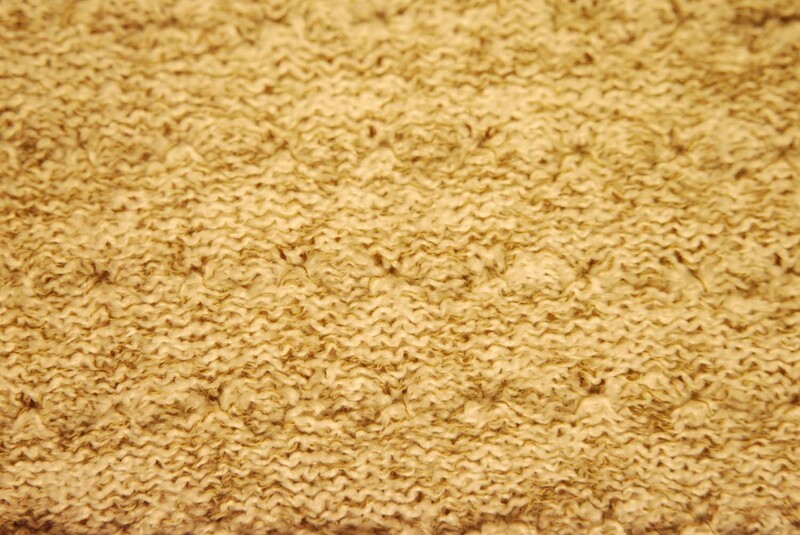 I hope to be able to buy some more yarn this weekend so I can get started on a real sweater. 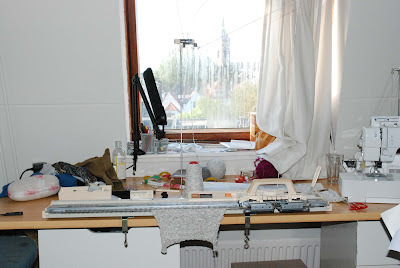 So, today I finally got to try out the knitting machine. By the way, thank you for all the advice to my first post about it. I just didn't know what the 'sponge bar' was supposed to be because my manual is only in Dutch and French. I know have the theory it's the bar holding the needles in place. It's described in the manual as a felt bar but it's actually foam- or sponge-like stuff and that isn't in great shape although it doesn't appear to hinder the performance of the machine. I started by cleaning it and oiling those parts which the manual told me should be oiled. It wasn't too bad. There was just a modest amount of lint in some of the gears of the sled. Then, I started setting it up, being afraid to damage something with every step. And man, that thread tension gizmo, which was very easy to assemble, is really odd. Those long thin stalks at the top are supposed to bend way down when in use, causing the tension on the thread. For thread, I used the spool of knitting thread I own. It's a remnant my mother gave me, though she got it from someone else as well. It's good for this purpose because it's a pre-made spool but I guess the numbly texture of the yarn is less than ideal. It was time to set up some stitches. I followed the manual and started with the easiest method, using the set-up comb. This method doesn't give you a finished edge and is normally used only for test squares and starter edges for some special stitches (which are to be removed when the garment is assembled). It took me quite a number of tries to get it right. First with the manipulation of the comb, then with the exact way of inserting the thread into the sled. And then I found one needle with a bent upper bit, so I had to change that. Once I got the hang of it though, it was easy. 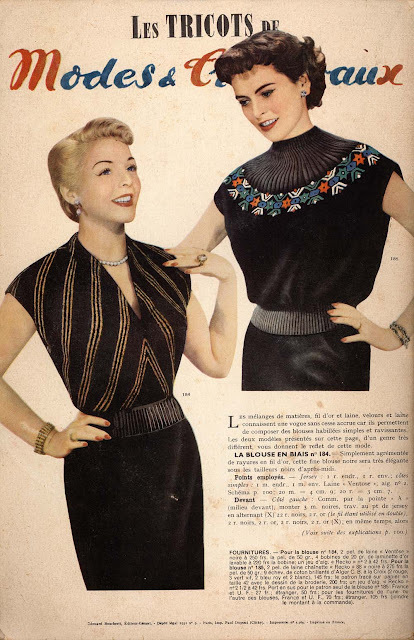 And simple, straight knitting was both fast and easy. With that done, I decided to try one of the simpler fancy stitches. This one doesn't use the separate ajour sled, and not too many of the various options, so I thought it would be a good place to start. This, too, didn't go right straight away and there were some scary moments with the sled almost getting stuck because too much yarn was collecting on the 'paused' needles. However, when I realised the great importance of making sure the sled was in 'plain' mode and switching its little lever at the correct stage of knitting the pattern, it worked. 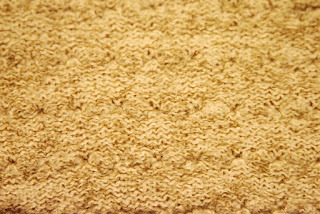 My sample is rather underwhelming compaired to the picture in the manual, but I think that's because of the texture of the yarn. Now, the big question is: What to do first? Tackle real ajour knitting and make a scarf? Or face the challenges of adding and/or substracting stitches and make a simple sweater? This was just going to be a simple post to show you my new dress (unfortunately, I once again over-estimated the amount of free time available to me, so I haven't had time to try out the knitting machine yet). But now, I think I should tell its full story. Because I read Tanit-Isis's latest blog post. Last Tuesday, 4 September was my 32th birthday. I had sort of thought about doing a nice post about it, but between just returning from holiday and normal life (being rather frustrating with a job opportunity I'd been promised and waiting for failing to materialize) taking over, I ran out of time and spirit. Not that it was really a bad birthday, not at all. E was home all day and cooked me a really nice dinner and I received the best wishes from my family. I had planned to wear this dress for that dinner... but I didn't finish it in time. It's a fairly simple retro-y dress in black stretch cotton. It has the weight of twill but there are flowers woven in (impossible to photograph properly). 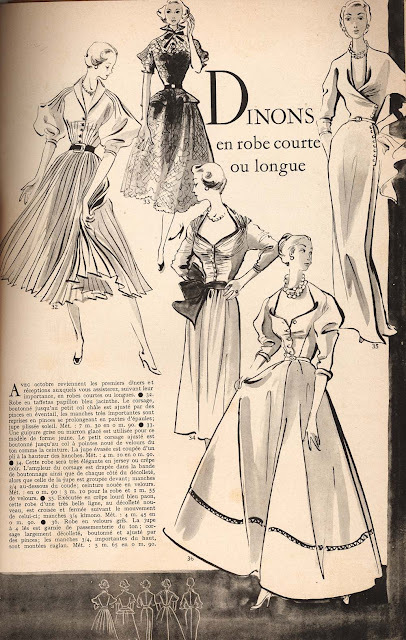 The firmness of the fabric made it a perfect candidate for a dress with a slim skirt. That skirt has front pockets which stand out a little bit and a single pleat at center back for walking ease. 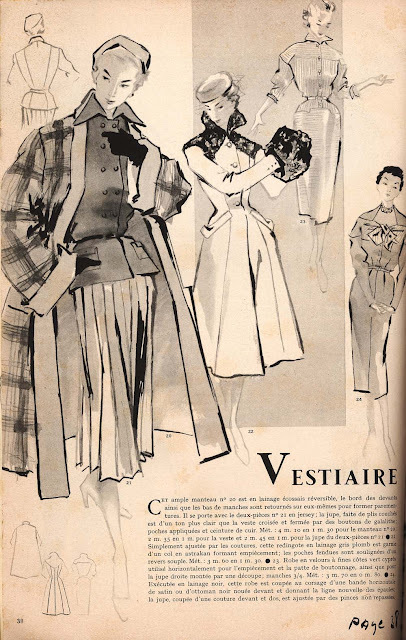 So far, I've always used (often double) box pleats, but this single pleat is a feature I've come across quite a lot in vintage sewing magazines. The bodice has short fitted kimono sleeves with under-arm triangles and a wide-ish V neckline at front and back. Of course, I muslined that feature, to make sure it wouldn't slide down from my shoulders. I changed the angle of the shoulder a bit for that reason and it worked really well. Although, as a result, the whole top sits a little higher than usual, which doesn't cause any fitting problems except making the waistline about 1 cm too high (which, fortunately, isn't very noticable, especially with the belt). Oh, and there's a side zipper. And even if I had finished it in time, I'm not sure I would have worn it for my birthday dinner. The weather here is unexpectedly summer-y this week, so it might have been too warm anyway. Do you recognise my latest purchase? I know this is no way to show it off (on a rug to protect the new table and surrounded by all kinds of stuff...) but still, I'd only just carried it into the house. 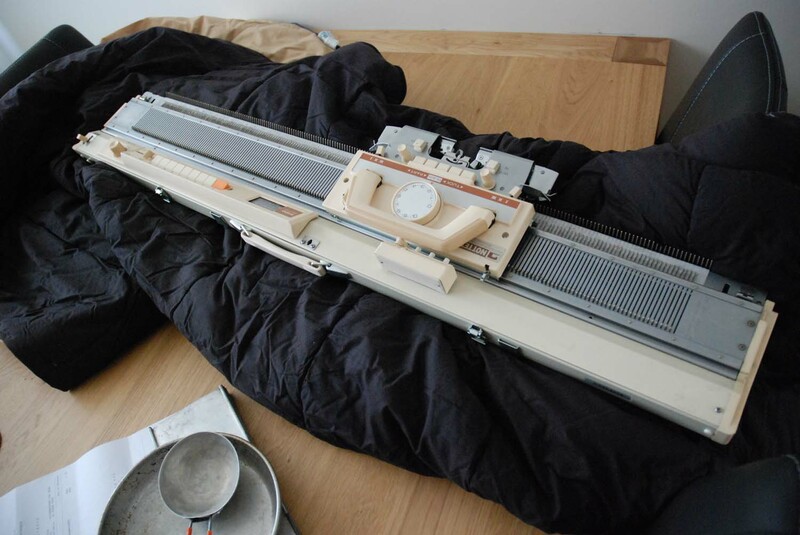 It's a knitting machine, a Brother KH 710 to be precise. I don't really know how old it is but there's one picture with a person in it in the manual (well, just a bit of torso) and judging from her clothes I'd say 1960's. I bought it, I think, cheaply in an online auction. As you may know by now, I hardly knit. I've made two perfectly wearable items but they took me a very long time. I only learned how to knit a few years ago and I've never been able or willing to invest the time to get good and fast at it. And of course, my lovely grandmother has volunteered to knit for me twice. I'm afraid working with this machine will require a bit of a learning curve but fortunately, I have the manual. Testing it out may have to wait till Friday, but I'm really curious. Does anyone have any good advice on the subject?